Why JUST-KILIMANJARO? — Just Kilimanjaro (T) Ltd. There are several factors that go into a successfull climb. SAFETY FIRST – Without a doubt, safety is our top priority. Our crew is First-Aid trained and receive refresher course every 2 years accompanied by a Wilderness First-Responder in each trek. These are the guys that help me take you up and bring you back down safely. Together with you, we are able to notice any ill symptoms, assess the situation and take appropriate action. SUPERIOR EQUIPMENT – Quality equipment is another important factor. It can sometimes be the difference between success or getting off the mountain. Night temperatures can sometimes plumet well into the teens below freezing -not to mention rain! We use 4-Season NORDISK OPPLAND III tents for sleeping and HILLEBERG ALTAI for dinning. 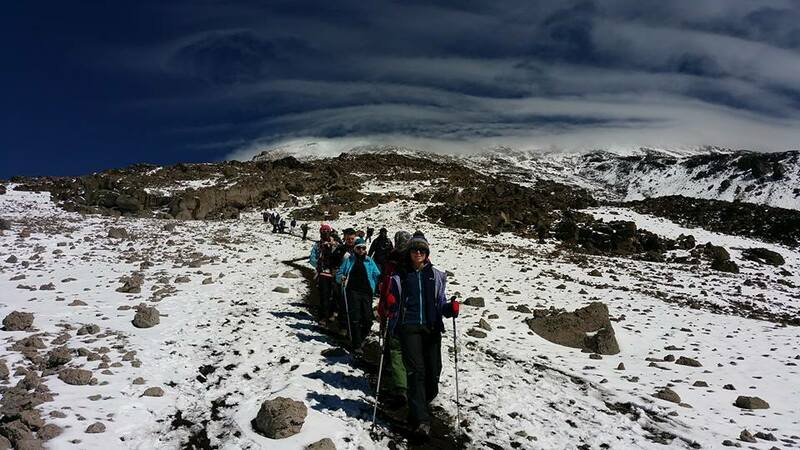 KILIMANJARO SPECIALISTS – All we want to do is to climb Kilimanjaro. TASTY COMFORT FOOD – If you do not eat, you are going to be low on energy, emotional levels will also be low etc etc and we have not spoken about the impact this will have on the summit day. We serve a variety of comfort food such as burgers, chops, stews, biryan, eggs of every kind and many many more. We love to change the menu often and bring in new and tastes and flavors suitable for just about any Kili appetite. Our meats are sourced from Farmer's Choice and Dano's Butcher sealed in vacuum packaging and frozen to prolong freshness. We do not keep meat for more that 3 days when a re-supply is due. PERSONAL GUIDED TREKS – We believe each trek is different. Some climbers use less time while others need more of it. Some are suited for the Umbwe while others should take the Lemosho. We are happy to help you design your trek of a lifetime to maximize your chances of getting to the top and back down safely. EXPERIENCED GUIDING – Your guide is one of the most important person on the mountain. This is the person to go to in most situation especially when the going-gets-tough. This is your guardian, leader, confidant, source of energy and motivation. We have been at it for 16 years. OPEN GROUPS – Climbing Kilimanjaro is expensive. And add to that flight, lost wages etc. It is even more expensive if you climb solo. Save loads by latching onto one of our 'Open Groups'. Minimum 5 and maximum 16. Small groups, intimate atmosphere, huge savings. RESPONSIBLE – Without a doubt, our staff play a crucial part in the success of our operations. Because we believe they deserve it, we pay more that the recommended wage and on time. We also distribute 100% of the gratuity fairly to the crew everytime! SUCCESS – We have better than 99% success rate on the mountain.